Nauta Peterson 105' is a sloop built by the Constructions Mecaniques de Normandie boatyard in Cherbourg, designed in collaboration with Nauta Design, Doug Perterson and Castlemain France. The hull is in aluminium while the deckhouse and deck are in composite material and the rig is made of carbon. The interiors, designed by James Ultramarine and Nauta, follow a layout that includes a suite for the owner, three cabins for the guests, full width saloon amidships while, astern, there is a double cabin reserved for the crew plus the master's single cabin. 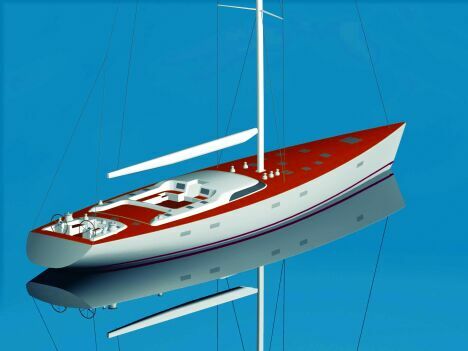 The main engine will be a 350 HP Cummins CTA 8.3 MI, with which this sloop can sail at a speed of 11 knots. Its limited draught of 3.5 m offers the owner the possibility of visiting most of the bays in the Mediterranean, without having to give up on comfort and spacious living. For further information please visit the website www.cmnyacht.com. CMN Shipyard: 51 rue de la Bretonniere, bp 53950105, Cherbourg Cedex (France); tel +33 233883000; fax +33 233883198; e.mail info@cmn- cherbourg.com; sito web www.cmnyacht.com.